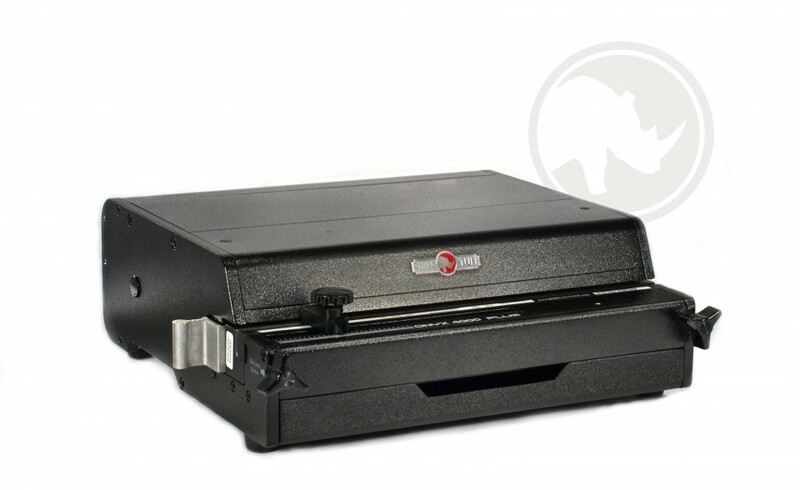 Dimensions: When assembled, the Onyx 4000PLUS is 6 inches high, 16 inches wide, and 15 inches deep – the perfect size for doing a large amount of work in a small space. Only 27 pounds, with a shipping weight of 31 pounds, the machine is sturdy, but can sit on a table without requiring a heavy-duty stand. See the machine in action here. Power Requirements: Operating on 115 Volt AC/2.5 A/60 Hz, the Onyx 4000PLUS cycles 20 times per minute for smooth, consistent performance. Side Margin Controls: A knob on the front left of the machine helps you measure the size you need, as both the machine and the dies are clearly marked. Before beginning your job, you should use some scrap paper to verify that the holes are lined up correctly against the stop that guides the paper. If you need to make adjustments in case of partial punches or miss punches, you can easily remove the die to correct the problem before starting on your job. Your test punches will let you know how many sheets of thicker paper you can use at a time. Easy Die Changes: Need to adjust the die? Simply loosen the two thumb screws at either side of the machine to release it. Just pull out the patented Swing Away Die Pin Retainer bar that keeps the die in place, and you can insert another die or disengage any of the pins, which are labeled for easy identification. Once you have replaced the die or removed pins, you can depress the pedal to make another test punch. How to Operate: Simply use the pedal, which you activate by hand or by foot. If you prefer, you can also fit your machine with a Versa Switch. Auto Reverse: To prevent jams, the machine has an Auto Reverse feature that detects obstructions, misaligned paper, or too much thickness and reverses the direction of the pins. Adding the spine: Once the holes are punched to perfection, you can insert the comb or coil and then move on to the next set of documents to be punched. Rhin-O-Tuff offers modules to help you open, close, and insert the spine of your choice. Waste Tray: A waste tray accessible from the front of the machine catches hole punchings for easy disposal. 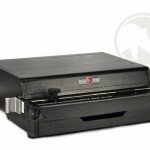 You can buy or lease the Onyx 4000PLUS from a Rhin-O-Tuff dealer at an affordable price point. The interchangeable dies are available separately, so you can choose the pattern and binding media you prefer. Available only through authorized dealers and distributor partners,this versatile machine has an unbeatable three-year warranty. The 4000PLUS is part of the acclaimed Onyx Series that recently received a Reader’s Choice Award for the Top Binding and Bookletmaking equipment from Quick Printing Magazine.